Postdoctoral Researcher Tetsuya Kotani, Associate Professor Hitoshi Nakatogawa, Honorary Professor Yoshinori Ohsumi and colleagues at Tokyo Institute of Technology have analyzed the Atg protein Atg2, whose function was previously unknown, and have discovered that Atg2 tethers the pre-autophagosomal membrane to the endoplasmic reticulum during autophagosome formation. Autophagy is the mechanism that degrades cellular components such as proteins, ribonucleic acids (RNA) and organelles, and is highly conserved from yeast to humans. When autophagy is induced by stresses such as starvation of nutrients, a flattened membrane vesicle called an isolation membrane appears and expands spherically to engulf materials to be degraded, closing to form a double-membrane vesicle called the autophagosome (Figure 1). The completed autophagosome then fuses with a lysosome or a vacuole and the materials inside the autophagosome are degraded by enzymes inside the lysosome or vacuole. Many Atg proteins playing roles in autophagosome formation have been identified. However, the specific roles of individual Atg proteins in membrane formation are still poorly understood, and the details of the mechanism of autophagosome formation have still not been elucidated. The research group analyzed the function of Atg2, one of the Atg proteins playing a role in autophagosome formation in the budding yeast Saccharomyces cerevisiae. Atg2 is a large protein made of 1,592 amino acids, but any functional domains are not predicted based on the amino acid sequence. 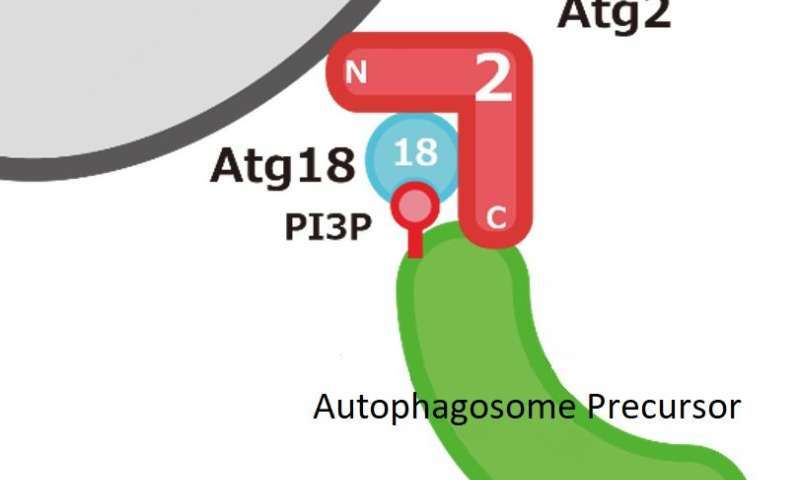 It had been known that Atg2 forms a complex with Atg18, a protein that binds to phosphatidylinositol 3-phosphate (PI3P), and that this was the last among Atg proteins to localize at the site of autophagosome formation. However, its specific function had remained unknown. The comparison of Atg2's amino acid sequence among different organisms revealed that N- and C-terminal regions have been highly conserved. The group then prepared many Atg2 variants, focusing on these two regions, and evaluated autophagy activity. As a result, they found that regions vital to the function of Atg2 exist in N- and C-terminal regions. Further, by in vitro experiments using Atg2 purified from yeast cells and liposomes (artifical membrane vesicles), the group demonstrated that both the N- and C-terminal regions of Atg2 have the ability to bind to a membrane, and that Atg2 tethers the two membrane structures together by means of these two membrane-binding regions. They also revealed that the C-terminal region is required for Atg18 to bind to membranes containing PI3P, and that it is required for the Atg2-Atg18 complex to localize to the site of autophagosome formation. By contrast, they demonstrated that the N-terminal region plays a vital role after the Atg2-Atg18 complex has localized to the site of autophagosome formation, and the possibility that it is involved in the association of Atg2 with the endoplasmic reticulum. Thus, the group proposes the model that Atg2 tethers pre-autophagosomal membranes (autophagosome precursors) to the endoplasmic reticulum, initiates autophagosome formation, and mediates membrane expansion (Figure 2). 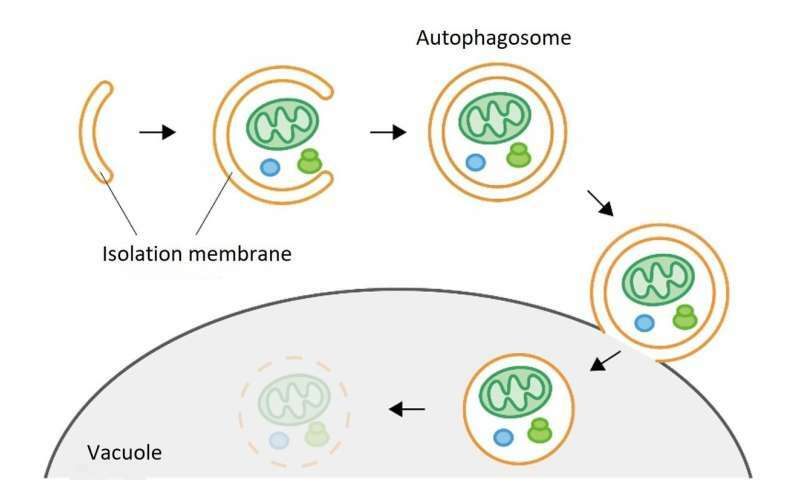 Although the formation of the autophagosome with its double-membrane structure is the most unique feature of autophagy, there remain many questions about this process, such as where the membrane comes from and how it is supplied. Previous reports had suggested that the endoplasmic reticulum supplies the membrane for autophagosome formation. Consistent with this model, the research demonstrated the possibility that Atg2 tethers pre-autophagosomal membrane and the endoplasmic reticulum. However, the mechanism of membrane expansion, such as how lipids are transported from the endoplasmic reticulum to pre-autophagosomal membrane, remains unknown. Analyzing in detail where on the endoplasmic reticulum Atg2 binds and what happens after tethering between pre-autophagosomal membranes and the endoplasmic reticulum is anticipated to lead to unraveling the mechanism of the membrane expansion. Autophagy is reported to be related to various diseases such as neurodegeneration and cancer. Understanding the mechanism of autophagosome formation is anticipated to provide fundamental information to discovering drugs to treat such autophagy-related diseases.